Brooklyn Heights. 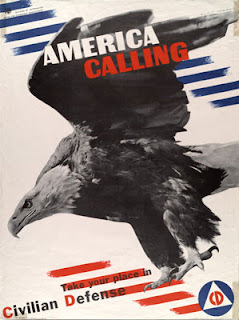 It was fought on August 27, 1776 and was the first major battle of the American Revolutionary War to take place after the United States declared its independence on July 4, 1776. 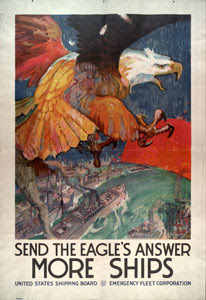 It was a victory for the British Army and the beginning of a successful campaign that gave them control of the strategically important city of New York. In terms of troop deployment and fighting, it was the largest battle of the entire war. After defeating the British in the Siege of Boston on March 17, 1776, commander-in-chief General George Washington brought the Continental Army to defend the port city of New York, then limited to the southern end of Manhattan Island. Washington understood that the city's harbor would provide an excellent base for the British Navy during the campaign, so he established defenses there and waited for the British to attack. In July, the British under the command of General William Howe landed a few miles across the harbor from Manhattan on the sparsely-populated Staten Island, where they were slowly reinforced by ships in Lower New York Bay during the next month and a half, bringing their total force to 32,000 troops. Washington knew the difficulty in holding the city with the British fleet in control of the entrance to the harbor at the Narrows, and he moved the bulk of his forces to Manhattan, believing that it would be the first target. 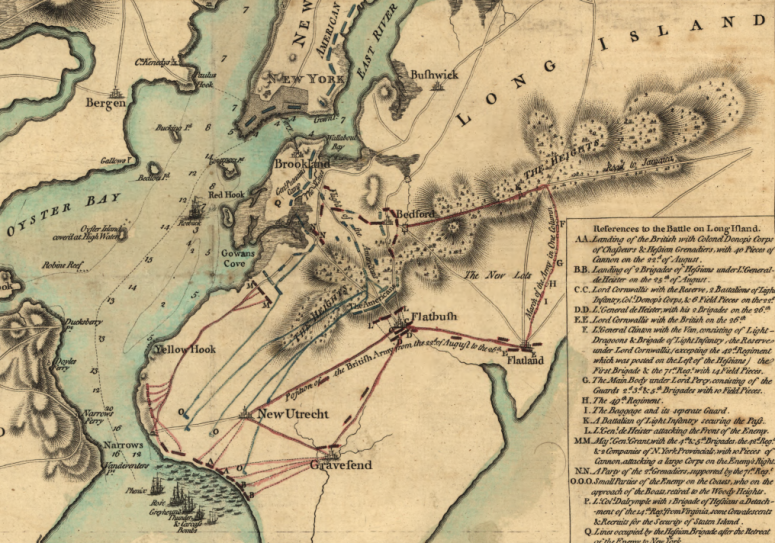 On August 22, the British landed on the shores of Gravesend Bay in southwest Kings County, across the Narrows from Staten Island and more than a dozen miles south from the established East River crossings to Manhattan. After five days of waiting, the British attacked American defenses on the Guan Heights. Unknown to the Americans, however, Howe had brought his main army around their rear and attacked their flank soon after. The Americans panicked, resulting in twenty percent losses through casualties and captures, although a stand by 400 Maryland troops prevented a larger portion of the army from being lost. The remainder of the army retreated to the main defenses on Brooklyn Heights. 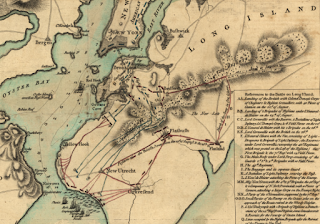 The British dug in for a siege but, on the night of August 29–30, Washington evacuated the entire army to Manhattan without the loss of supplies or a single life. Washington and the Continental Army were driven out of New York entirely after several more defeats and forced to retreat through New Jersey and into Pennsylvania. The rout was a humiliating defeat for Gates, the American general best known for commanding the Americans at the British defeat of Saratoga, whose army had possessed a large numerical superiority over the British force. Following the battle, he never held a field command again. His political connections, however, helped him avoid inquiries and courts martial into the debacle. Gates formed up first on the field. He had about 4,000 troops, of which only 1,500 were Continental regulars. On his right flank he placed Mordecai Gist's 2nd Maryland and the Delaware Regiment (Johann de Kalb was with the Regulars). On his left flank, he placed 2,500 untried North Carolina militia under Maj. Gen. Richard Caswell. Gates stayed with the reserve force, the 1st Maryland Regiment under William Smallwood. Gates placed seven guns along the line. Behind the militia, he placed companies of cavalry and light infantry. With this formation, though a typical British practice of the time, Gates was placing the untested militia, his weakest forces, against the most experienced British regiments, while his best troops would face only the weaker elements of the British forces. Cornwallis had roughly 2,100 men, of which about 600 were Loyalist militia and Volunteers of Ireland. The other 1,500 were British regulars. Cornwallis also had the infamous and highly experienced Tarleton's Legion, some 250 cavalry and 200 infantry who were formidable in a pursuit situation. Cornwallis formed his army in two brigades. Lord Rawdon was in command of the left, facing the Continental Infantry with the Irish Volunteers, Banastre Tarleton's infantry and the Loyalist troops. On the right was Lt. Col James Webster, facing the inexperienced militia with the 23rd Royal Welch Fusiliers and the 33rd Regiment of Foot. In reserve, Cornwallis had two battalions of the 71st Regiment of Foot and Tarleton's cavalry force. He also placed four guns in the British centre. While the militia was being routed, and before Gates' flight, he ordered his right flank under de Kalb to attack the opposing British militia forces. Rawdon's troops advanced in two charges, but a heavy fire repulsed his regiments. The Continental troops then launched a counterattack which came close to breaking Rawdon's line, which began to falter. Cornwallis rode to his left flank and steadied Rawdon's men. Instead of pursuing the fleeing militia, Webster wheeled around and launched a bayonet charge into the left flank of the Continental regiments in the center. The North Carolina militia that had been stationed next to the Delaware regiment held its ground, the only militia unit to do so. The Continental regiments fought a stiff fight for some time, but only 800 Continentals were by this time facing over 2,000 British troops. Cornwallis, rather than fight a sustained fight with a heavy loss, ordered Tarleton's cavalry to charge the rear of the Continental line. The cavalry charge broke up the formation of the Continental troops, who finally broke and fled. De Kalb, attempting to rally his men was shot eleven times by musket fire. After just one hour of combat, the American troops had been utterly defeated, suffering over 2,000 casualties. Tarleton's cavalry pursued and harried the retreating Continental troops for some 20 miles (32 km) before drawing rein. By that evening, Gates, mounted on a swift horse, had taken refuge 60 miles (97 km) away in Charlotte, North Carolina. After the early summer collapse of the Union Peninsula Campaign offensive to capture Richmond, Robert E. Lee sought to move his army north and threaten Washington DC before Union forces could regroup. His trusted and highly capable "wing" commanders, Maj. Gen. "Stonewall" Jackson and Lieut. Gen. James Longstreet, brought Lee's army within 35 miles of the Union capital by the end of August. Jackson, who had burned the Federal supply depot at Manassas Junction on August 27th, waited for the arriving Union army just west of the old Bull Run battlefield. 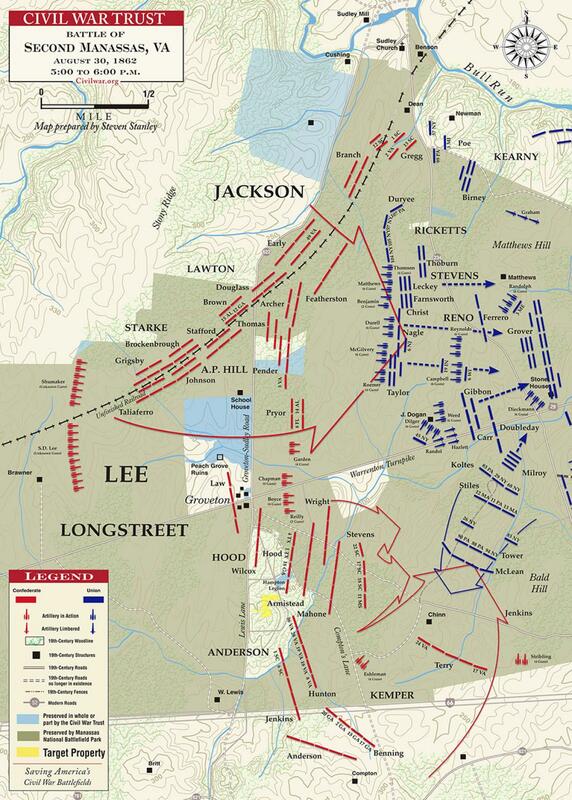 Longstreet, trailing Jackson, fought his way eastward through Thoroughfare Gap the next day. In order to draw Maj. Gen. John Pope’s new Union Army of Virginia into battle, Jackson ordered an attack on a Federal column that was passing across his front on the Warrenton Turnpike late on the 28th. The fighting there at Brawner Farm lasted several hours and resulted in a stalemate. Pope became convinced he had trapped Jackson and concentrated the bulk of his army against him. On the 29th, Pope launched a series of assaults against Jackson’s position along an unfinished railroad grade. The attacks were repulsed with heavy casualties on both sides. 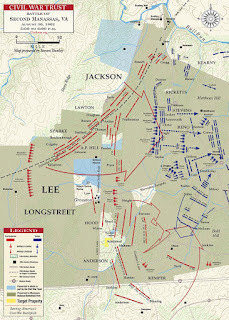 At noon, Longstreet arrived on the field and took position on Jackson’s right flank. The afternoon of the 30th, Pope renewed his attacks, seemingly unaware that Longstreet was on the field. When massed Confederate artillery devastated a Union assault by Maj. Gen. Fitz John Porter’s Fifth Corps, Longstreet’s wing of 28,000 men counterattacked in the largest, simultaneous mass assault of the war. The Union left flank was crushed and the army driven back to Bull Run. Only an effective Union rearguard action prevented a replay of the First Manassas disaster. blockade running vessels from the Gulf of Mexico port city of Mobile, Alabama. On August 3rd, 1,500 Union infantry and cavalrymen under Maj. Gen. Gordon Granger landed on Dauphin Island and laid siege to Fort Gaines west of the ship channel. 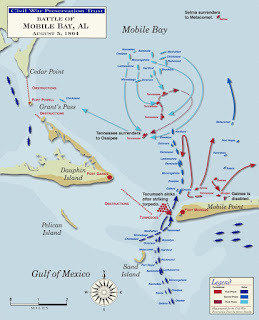 On August 5th, Admiral David G. Farragut’s Union fleet of eighteen ships, including four ironclad monitors, entered Mobile Bay in a double column and received a devastating fire from both Fort Gaines and Fort Morgan, east of the channel. Farragut's fleet successfully navigated the narrow, torpedo-filled passage, losing only the ironclad USS Tecumseh. After successfully passing both forts, Farragut engaged the small Confederate naval force inside the harbor under Adm. Franklin Buchanan, including the ironclad ram CSS Tennessee, and forced it to surrender. Without naval support, the garrisons of both forts were vulnerable and could not be resupplied. 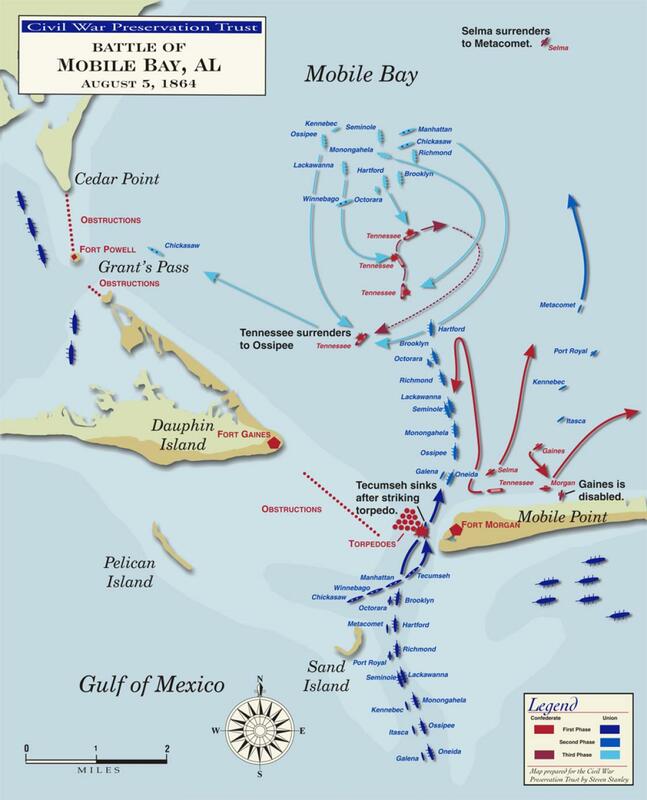 Farragut and Granger next turned their attention to Fort Gaines, forcing it to surrender on August 8th. Fort Morgan, the larger of the two forts, held out longer, finally surrendering on August 23rd. The loss of the Confederate fleet and forts essentially shut down the port, although the city of Mobile would not surrender until three days after Lee's surrender at Appomattox. Closing Mobile Bay was an important part of placing a sea stranglehold on the Confederacy which was completed later by the capture of New Orleans and taking control of the Mississippi River. The excellent Cival War maps are from the Civil War Trust, a highly recommended site. 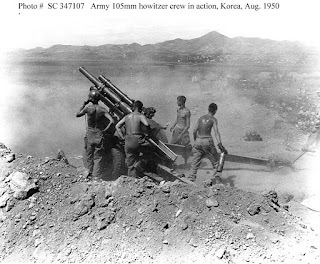 The Battle of Pusan Perimeter took place in the fall of 1950 and was one of the first major conflicts of the Korean War. The North Korean army was invading South Korea and attacking the forces sent by the United Nations. These troops were composed of those sent by not only the United States and Great Britain but also South Korea, the Netherlands, Canada, New Zealand and Australia. 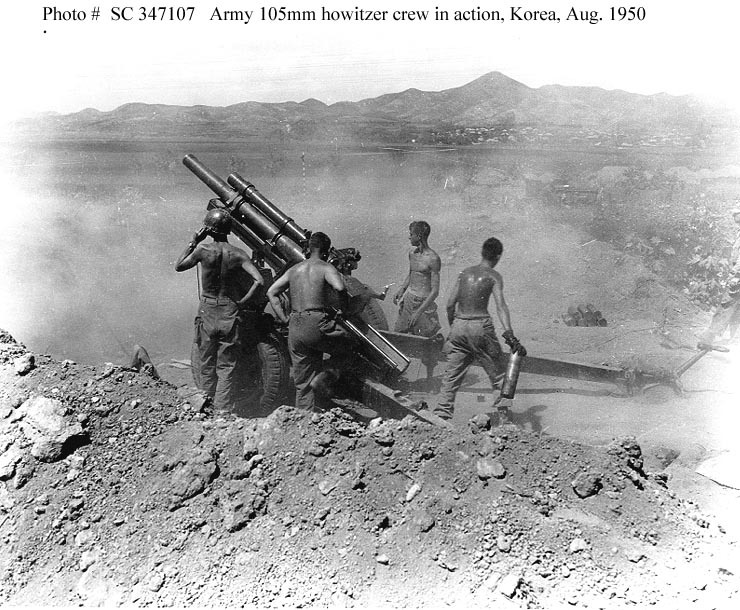 Eventually, though, the 140,000 United Nations troops were facing defeat at the hands of 98,000 North Koreans. They won the battle during their final stand. 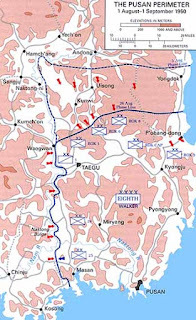 During the battle, the North Koreans managed to drive back the United Nations forces to the Pusan Perimeter. The Pusan Perimeter is a 140-mile stretch of land on the Korean Peninsula that is also home to Pusan, a port. striking in other locations. Regardless, the United Nations troops stood firm and managed to outlast the multiple attacks. It was very helpful the United Nations had access to the port of Pusan, which enabled them to ship in extra manpower, equipment and more. Eventually, after waiting them out, the North Koreans retreated. 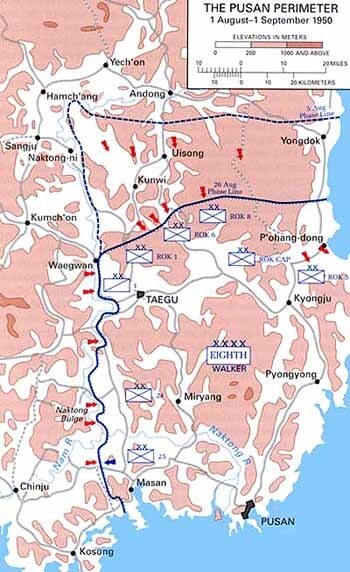 The Battle of Pusan Perimeter was the furthest South the North Koreans would make it during the war.